Description of Project: Family and Community Services (FACS) are a government department responsible for a broad and challenging range of social policy work in New South Wales, including statutory out of home care (OOHC) for children and young people. In recent years, the provision of this care has moved to a partnership between FACS and the non-government sector, particularly in the areas of placement and case management. Managing this relationship well is fundamental to ensuring good outcomes for children, young people, families and carers in OOHC. When FACS approached Second Road, the way the relationship should be managed was articulated in two key modes: a 30 page policy document and a similarly lengthy table of over 130 compliance requirements. The language was mostly bureaucratic and the table was hard to comprehend and navigate. The challenge was to create new artefacts that dramatically lifted their usefulness and accessibility. Our goal was to create documents that dramatically enhanced caseworkers’ understanding of the policy and process for how the relationship should work, in an accessible and easily navigable way. This required refocusing the documents from compliance to the end user, a much clearer and tighter organising structure and a preference for visual rather than word-based communication. The first document helps orient staff around the policy. 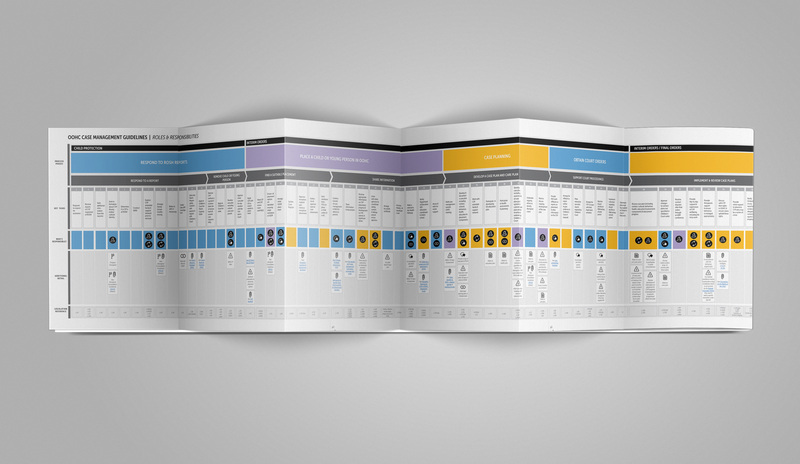 It includes a high-level overview of key information and clear descriptions of the main roles and stages in the OOHC process, guiding principles and responsibilities, straight forward answers to common questions and a visualisation of the interactions between agencies. Accompanying this is a document and poster that visually communicate specific detail around the policy. As well as clear, step-by-step descriptions of activities, colours and icons are used to visually identify important information such as responsibilities, exceptions and other references and resources. Together, the two documents allow caseworkers to better understand the key aspects and structure of the policy as well as the detail that sits behind it. They have succeeded in making information easier to both find and understand, and the user-friendly format allows easy navigation of the process and clarification of roles and responsibilities. Overall, an improved understanding of the guidelines, roles and responsibilities, interactions, steps and resources required by staff ensures that the best outcomes are achieved for all involved, further allowing caseworkers to focus on and support the most vulnerable families.